Golf officially began in Bloemfontein when Dr CH Bidwell placed an advert in the local newspaper “The Friend” which simply read “It is the purpose to form a golfing club in Bloemfontein for which purpose a meeting for those interested in the game and desirous of joining the club will be held in the council chambers at 6 o’clock on Saturday afternoon next, 3rd February 1894. 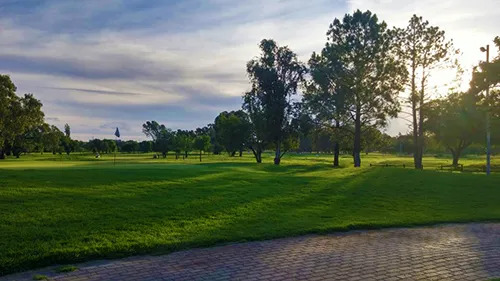 Golf in Bloemfontein has grown over the past 115 years and the parklands layout which was originally designed by Bob Grimsdell at the present location near to the Bloemfontein Airport and has since been upgraded and redesigned by Matchovich and Hayes. The Bloemfontein Golf Club is a club steeped in tradition but has also adapted and moved forward with the times. BGC is a member based club and we are proud to host many corporate days of the leading companies in Bloemfontein. We are proud to have hosted an exhibition match between Jack Nicklaus and Gary Player in 1966 as well as the South African Open Championship in 1958 and 1963. BGC has been host to the Vodacom Origins of Golf Tournament on the Sunshine Tour for the past 8 years and we are honoured to have hosted numerous inter provincial tournaments over the last 13 years. The standard of the course is important to the members and we strive to improve the condition as well as add minor changes to the layout so as to offer a course that is a challenge off the back tees as well as being fun and playable off the other tees.